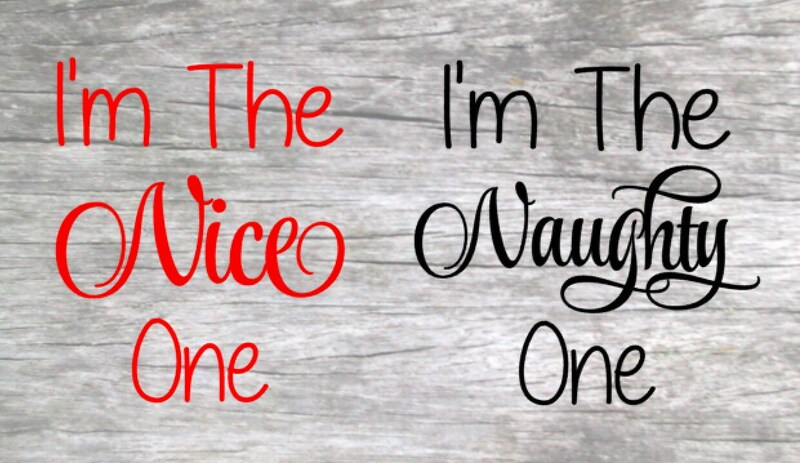 SIZE: Nice: 2.5" W X 3" H - Naughty: 3" X 3"
COLOUR CHOICE: Choose from the Colour Drop Down Menus. 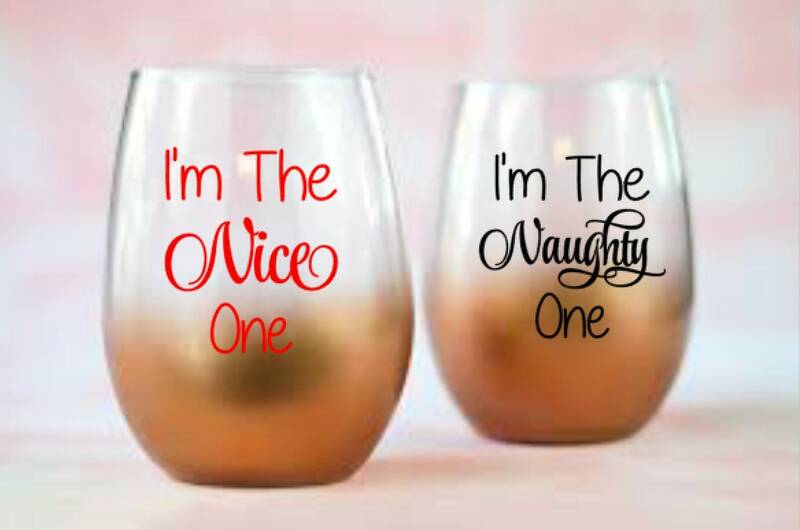 Primary Colour is for the "I'm The Nice One" decal. The price is for the decal as shown, in the size listed. The size choices (if any) are in the drop down menu. The decals are sized as OVERALL DIMENSIONS, from the top of the tallest letter to the bottom of lowest letter, and from the farthest point left to right for width. Or in the case of graphics from the tallest point to the lowest point, and left to right for width. Images shown are enlarged to show detail and are not of actual size. The actual size of the decal is as listed in the size choices and/or description. There is no background, clear or otherwise. The decal applies directly to the surface. Our decals are precision die-cut on a professional vinyl plotter, using premium quality Oracal 651 vinyl. The transfer tape is already applied for easy application. Current processing time is 3-5 business days. Processing time does not include delivery time. Delivery time is estimated from the Postal Service based on your location. Standard shipping rates do NOT include a tracking number. For tracking number a shipping upgrade must be purchased at checkout. 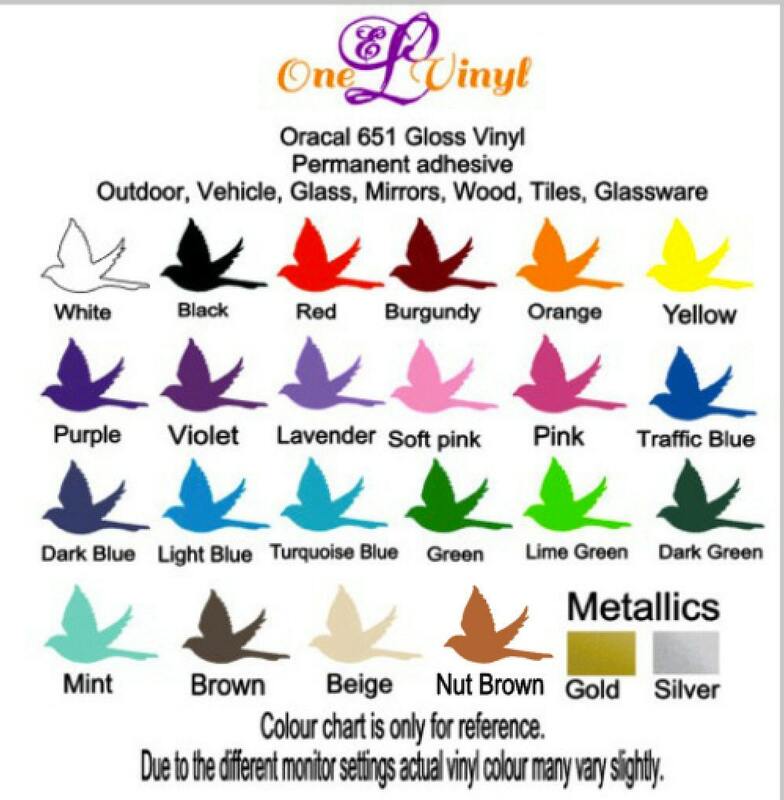 Vinyl Colours will vary depending on your monitor. Computers colours are not an exact match to the actual vinyl colour. Service disruptions caused by the Canada Post labor dispute are no longer in effect. While service has resumed, there may still be delivery delays into early 2019. Mail will still move and be delivered but will experience delays from normal delivery times. How long the delivery delay will be is unforeseen. I can not guarantee a delivery date. Delivery times vary depending on your location and the shipping method you choose. Estimated shipping times are listed on the shop's main page under "Announcements" and in the shipping policies. Within Canada is approx. 4-10 business days and to the USA approx. 10 to 21 business days, this delivery time is based on standard shipping (slowest). Shipping upgrades are available during the checkout process. Once I ship the item the delivery time is in the hands of the Postal Service. I have zero control over how long the postal service takes to deliver a package. The postal service does not consider a package lost until 30 days has past. Does the processing time include delivery time? No. This is the time allotted for me to process your order and have it ready for shipping. My vinyl decals will adhere to most smooth, non porous surfaces. Walls painted with Low VOC, Teflon, and other similar paints are designed to be "non-stick" and the vinyl may not adhere. If you are unsure please send me a convo and I can send you a test decal. Before applying a decal to any painted surface be sure to all the paint time to cure. On walls it is recommended to wait 3 weeks after painting before applying decals. For wood signs it is best to wait 24-48 hours. The longer the better. What's included in my order? With each order I include a test/practice decal and application instructions. Can the decals that are used for glassware be washed? Once the decal is applied to the glassware it is hand washable in warm water. They are not dishwasher safe. All decal sizes are listed as an overall dimension (+/- 0.5”)from the highest point to the lowest point and the points from farthest left to farthest right. Can I have more than one colour for one decal? Yes, some of our decals do come in two or more colour combinations. You may request your custom decal to be more than one colour as well. There is an additional charge if the decal is done in two or more colours. Since each colour has to be cut separate your decal will arrive with each piece/colour separate. Meaning; if you ordered a decal that said "Hello Sunshine" and wanted "Hello" in Black, and "Sunshine" in yellow, you would receive two decals; the Black Hello and the yellow Sunshine. It would not come as one decal as each colour is separate, and will have to be applied separate. Orders will be shipped to the address you have on your Etsy Account, as they appear on the order I receive. Please check your address prior to submitting an order and upon checkout! Anything returned to me due to an incorrect address will result in new shipping charges, which will be the responsibility of the buyer. There will be no refunds on missing packages due to an incorrect address. Once a package is returned to me, you will be refunded the purchase price, minus the actual shipping charge, as the Postal Service was paid for attempting to ship the package. Actual shipping charges may be higher than what you paid and are non refundable.